"I was walking with the messenger of Allah (s.a.a.w.) and he was wearing a mantle of Najran with a thick border. A Bedouin met him and pulled the mantle so violently that I saw this violent pulling had left marks from its border on the skin of the neck of the Messenger of Allah (s.a.a.w.). And he (the Bedouin) said: Muhammad!, command that I should be given out of the wealth of Allah which is at your disposal. The Messenger of Allah (s.a.a.w.) turned to him and smiled, and then he ordered for him a provision." Adi ibn Hatim al-Ta'ee came to the Prophet Muhammad (s.a.a.w.) to ask about Islam, so Muhammad (s.a.a.w.) invited him to his home. When they sat down, a small girl brought a pillow to the Messenger of Allah (s.a.a.w. ), however, he placed it between him and Adi and sat on the ground. Adi later said: "[When I saw that] I knew that he was not a king"
Muhammad (s.a.a.w.) would tie his own camel, feed his own animal, eat with the servants, knead dough with them, and carry his own groceries from the market. "We may not meet again after this year.It is possible that you may visit this mosque and my grave." "Much closer and dearer to me are the bondmen who fear Allaah, whoever they are and wherever they may be." Many Muslims have forgotten these lessons today.Contrast this attitude with that of some ignorant Muslims today who curse others to Hell and pray for their destruction. We don't know who is going where in the Next Life. We don't even know about ourselves. So let's keep making Dua that we stay on the right path and God guides others to it as well. We must not play God by assuming we know where others will end up. Among his numerous good attributes humbleness and simplicity acquired a high and distinguished position. Despite his position as leader, Prophet Muhammad (peace and blessings be upon him) never behaved as if he was greater or better than other people. He never made people feel small, unwanted or embarrassed. He urged his followers to live kindly and humbly. He released slaves whenever he could and gave charity, especially to very poor people, and orphans, without waiting for any reward. Prophet Muhammad (peace and blessings be upon him) himself was never greedy. He ate very little and only ate simple food. He preferred never to fill his stomach. Sometimes, for days on end, he would eat nothing but raw food. He used to bind stones onto his belly to appease his hunger and considered milk as sufficient if he did not have any other food. So he decided one day to go to Al-Ta'if to invite the people there to Islam, maybe God would guide them to the Truth. When he arrived, he was faced with even more hostility and rejection, to the point that young children started throwing stones at him, and his feet were injured and bled. On his way back to Makkah, he stopped for a rest, and angel Gabriel came to him, and offered to destroy the whole city of Ta'if, if the prophet wanted. "Oh, my Allah! To Thee I complain of the feebleness of my strength, of my lack of resources and of my being unimportant in the eyes of people. Oh, Most Merciful of all those capable of showing mercy! Thou art the Lord of the weak, and Thou art my own Lord. To whom art Thou to entrust me; to an unsympathetic folk who would sullenly frown at me, or to an alien to whom Thou hast given control over my affairs? Not in the least do I care for anything except that I may have Thy protection for myself. I seek shelter in Your light - The light that illuminates the Heavens and dispels all sorts of darkness, and which controls all affairs in this work as well as in the Hereafter. May it never be that I should incur Thy wrath, or that Thou should be displeased with me. I must remove the cause of Thy displeasure until Thou art pleased. There is no strength nor power but through Thee." Steadfastness was also his mien when he lost his own children who were a part of himself. Before the start of his Prophetic mission he lost two boys: al-Qasim and 'Abdullah, who were nicknamed at-Tahir and at-Tayyib. After the mission began, he lost three of his daughters, Zaynab, Ruqayya and Umm Kulthum, after they had married. Then after yearning a long time for another child, Allah gave him Ibrahim. He rejoiced greatly in him and found in him a replacement for those he had lost - and hoped that Allah would let him live to be a joy to him in is old age. However Ibrahim had not even reached the age of sixteen or eighteen months when he died. As he was dying, the Prophet, may Allah bless him and grant him peace, was informed and he leant on 'Abdu'r-Rahman ibn 'Awf for support owning to the intensity of his grief. He went to see Ibrahim in his mother's lap, gasping for breath, and he placed him in his own lap and said, "Ibrahim, we cannot avail you against Allah at all. " Then he was silent and wept. When he was certain that Ibrahim wad dead, the tears flowed from his eyes and he said, "Ibrahim, if it had not been that it is a true command and a true promise that the last of us will meet the first of us, we would have been more greived for you than this." 'Abdu'r-Rahman ibn 'awf said to him when he noticed him weeping. "and you as well, Messenger of Allah?'" He said, "son of Awf, it is mercy." Then the Prophet, may Allah bless him and grant him peace, said, "The eye weeps and the heart grieves, but we only say what is pleasing to our Lord. We are grieved to part from you, O Ibrahim." The Prophet, may Allah bless him and grant him peace, was content with Allah's decree, patient in what He willed so that he said to the mountain to which he entrusted his beloved son: "O mountain, if you had experienced the like of what I have, you would have crumbled, but we belong to Allah and we return to Him." 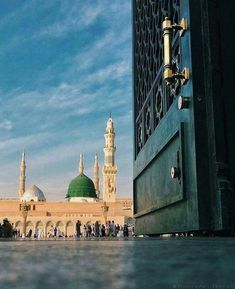 When the Muslims saw the grief of the Prophet, may Allah bless him and grant him peace, they tried to comfort him and he told them: "I have not forbidden grief. I have forbidden raising the voice in wailing. What you see in me is the effect of love and mercy in the heart. If someone does not show mercy, others will not show mercy to him. Allah shows mercy to those of His slaves who are merciful." These and many other countless events from the Prophet's biography demonstrate that Muhammad was a highly respectable, reputable, beloved, and kind character. Even before being divinely ordered by God to carry the divine message, he was called by his own tribesmen "As-Sadiq Al-Amin" (Arabic for "the truthful and the trustworthy"). "This day is the day of mercy. This is a day when honor cannot be transgressed. This is an honorable day for Quraish." Yes, Prophet Muhammad, peace be upon him, was a human being. When he eventually returned to Makkah after 21 years of persecution by the people of Makkah, he did not enter the city as a victorious king, but entered Makkah with his head bowing to His Lord as a humble servant of God, and he forgave the people of Makkah who had wronged him, attacked him, and fought against him saying, "Go, you are all free"
"Once, when I saw the Prophet in a very good mood, I said to him: "O Messenger of Allah! Supplicate to Allah for me!" So, he said: "O Allah! Forgive 'A'ishah her past and future sins, what she has hidden, as well as what she has made apparent." The Messenger of Allah (pbuh)said to me: "Does my supplication make you happy?" I replied: "And how can your supplication not make me happy?" He then said: "By Allah, it is the supplication that I make for my Ummah in every prayer."" It was he [the Prophet Muhammad] who turned the course of human thought from superstition-mongering, love for the unnatural and the inexplicable, and monasticism towards a rational approach, love for reality, and a pious and balanced worldly life. It was he who, in a world which regarded only supernatural happenings as miracles and demanded them for the verification of the truth of a religious mission, inspired the urge for rational proof and the faith in them as the criterion of truth. It was he who, in place of baseless speculation, led human beings to the path of rational understanding and sound reasoning on the basis of observation, experiment, and research. It was he who clearly defined the limits and functions of sense perception, reason, and intuition. It was he who brought about a rapprochement between spiritual and material values.